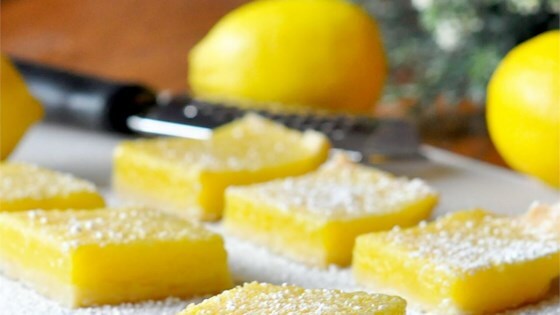 "This is a really easy recipe that my mom made before the lemon bar 'rage' was on! Thick-skinned lemons work the best. I suggest using real butter and eggs, I've tried using eggbeaters--nowhere near as good!" Mix 2 cups of flour and confectioner's sugar together. Cut in the butter or margarine. Mix well until the dough resembles pie dough consistency. Press the dough into a 9x13 inch baking pan. Beat together eggs, sugar, 4 tablespoons flour, lemon juice and lemon rind for at least 1 minute. Pour the mixture over the baked crust. Bake the bars another 20 minutes, or until the lemon topping has set. Sprinkle with confectioner's sugar when cooled. A deliciously classic lemon pie bar dessert! This is an great, simple recipe that I make with my 3 year old. If you halve the lemons and then nuke them for 10 seconds or so you can get a lot more juice. Super good. Awesome, Awesome, Awesome!!! I used 2 lemons for the juice and zest!! Drizzled with a thin frosting made with powdered sugar and lemon juice for a little extra zing and sweetness.